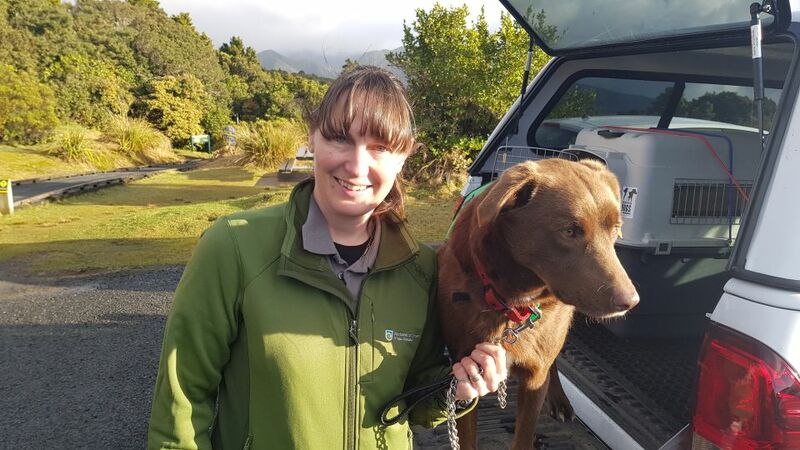 DOC Biodiversity Ranger and Conservation Dog. Aiding the recovery of endangered native wildlife. Whio surveying on Mt Taranaki which involves walking up river systems to monitor birds. Tai finds then indicates whio. Started in 2002 as a Trainee Ranger with DOC Taranaki. Working with Tai, experiencing beautiful places and seeing the whio population booming on the Mounga. Writing up the field notes in the office. Powelliphanta snails project on the mounga. Joe and Tai. Image: LEARNZ.